One of the things I have missed since going gluten free is Red Lobster’s Cheddar Bay Biscuits. About a year ago I found a recipe (before I was gluten free) that explained how to make them. So I thought I would give it a try. The original recipe only called for 2/3 cups of milk and as you know with gluten free stuff- that wasn’t enough to even moisten the dough. So I tried something. I combined the biscuit recipe from the GF box of Bisquick with this recipe. And it worked! My dad (who is not GF and used to work at Red Lobster) said it reminded him of their biscuits and I told him that was my goal. Mix together Bisquick, garlic powder in a bowl; cut in shortening. Mix in cheese, milk and eggs and mix until well blended. On a well greased cookie sheet (can line it parchment paper) drop dough by spoonfuls. notes: for the butter I ended up melting 4 tbsp of butter and only using 1 tsp of parsley. Next time I may use half the amount of garlic salt- so feel free to adjust according to your taste buds. 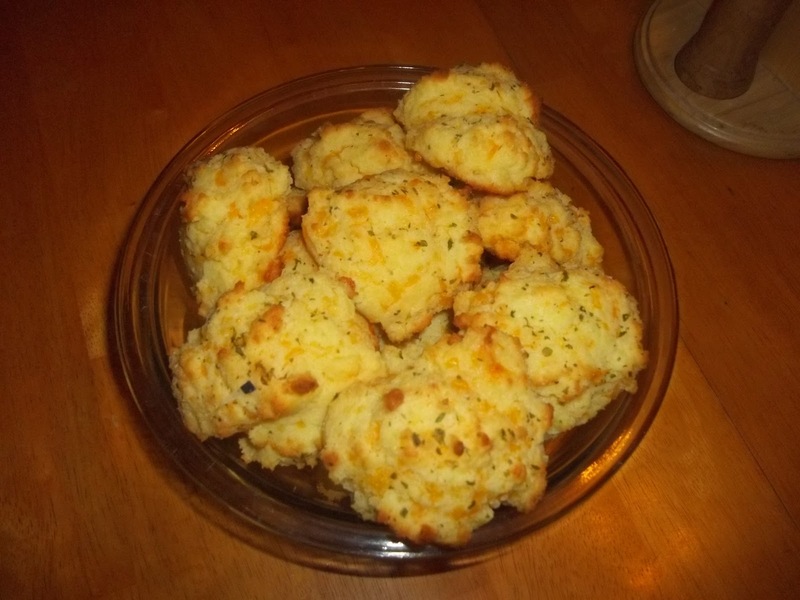 This entry was posted in Allergy Free Wednesday, Bread, Recipes on December 29, 2011 by Kandi. These biscuits look so tasty and addicting! Thank you so much for sharing your great recipe on Allergy-Free Wednesdays! Be sure to check back next week for recipe highlights (including the top 3 reader choice submissions and hostess favorites). Those look like Red Lobster bisquits. I eat those and I don’t need any other food! I need to try these. I’m pinning for future reference. Thanks for linking up at SweetTalkin’ Sunday! Thanks for sharing, I am sure these will be a hit at our next big meal gathering! I’m sure all of you pro’s can answer my question. I have a health problem and my doctor does not want me to eat any thing with gluten in it. Not even yeast.. I do not know enough about the two products to begin knowing how to eliminate them from my food or even why they are bad for me. Can any one help me to understand this problem ? I need to fix it soon, I’m starving to death. Lynda, First do not remove gluten until they test you for Celiac. That is an autoimmune disease that is genetically so if you have it chances are other families have it. Then to remove gluten you need to avoid foods that contain wheat, malt, barley, rye and oats. Most stores will have a “gluten free” section which will make it easier. Good luck!